on the one hand we see Ukip utterly failing to control and manage a small, ill educated claque of overt racists, whose outspoken views at all levels in the party have severely damaged their credibility both in the long term & short term – it has been the idiocy of the likes of Malcolm Pearson, Tony Bennet, Gerard Batten and their ilk that has provided the cloak of respectability for racism by a small fringe of ill informed and self serving idiots in the party. They also provided the opportunity for charlatans to leap on a poster of migrants streaming into Europe, a picture which had previously been used widely in the mainstream media, yet the fools in Ukip’s racist fringes had given the opportunity for accusations the party was using a racist poster! Similarly various party activists of particularly the extreme left wing seem to utilise stuctures like Hope Not Hate to act as their attack dogs to try to damage Ukip’s message amongst their followers, in the fear Ukip could grow to replace bot the Lib Dems and much of Labour in the long run – foolishly all such action gives rise to is increased publicity for Ukip. Just as manipulating and providing a cloak of respectibility to the more extreme Muslims gives rise, as a direct result of such as Hope Not Hate, to arm the Jihadist movement by pointing out and magnifying the actions of a few idiots in Ukip! That organisations like Huffington Post are thus enabled to post material world wide, such as they have, does Britain’s position little good globally, yet they are making the actions of a lunatic fringe on both sides of the superstitions’ divide seem like the norm, when in fact you will find that more people have been murdered by Irish criminals in their rivalry, or even by British armed Police together with those who have died suspiciously in custody than have been killed by so called Jihadists in recent years! 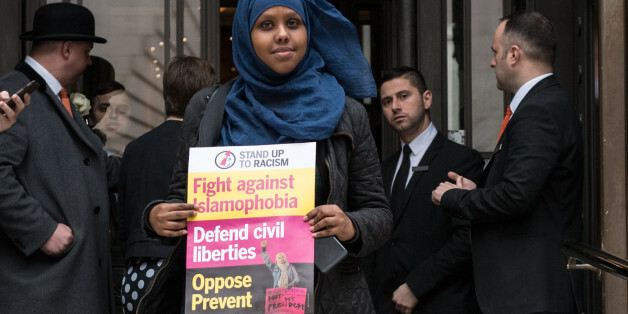 On Friday I joined other Stand Up To Racism campaigners at the launch of UKIP’s election campaign. This followed Paul Nuttall’s announcement that, among the rest of their anti-migrant and Islamophobic agenda, UKIP would campaign to ban the Burqa. This call has nothing to do with defending women’s rights. It has everything to do with UKIP demonising the Muslim community, just like in France last year when politicians campaigned to ban the Birkini. Why should anyone have the right to tell Muslim women what to wear? UKIP and their kind are constantly targeting people who just want to get on with their lives. It shows the nature of their party, it shows their racism. We were ejected from the press conference, quite forcefully, when we raised what we thought was the problem with UKIP’s agenda. I thought it was important that we protested. UKIP are not just an ordinary party. They want to cause division, they want to scapegoat people because of their religion. I went to their election launch to show that we won’t simply stand back and let them get away with it. In recent months, in the wake of the EU referendum we’ve seen a spike in the number of hate crimes in the UK. Among the victims have been a number of Muslim women. My friend Nahella Ashraf, another Stand Up To Racism activist was attacked in a chip shop last January in Hammersmith West London, where a man attempted to rip off her hijab. The kind of statements made by Nuttall and UKIP lay the ground for these attacks by making us a target. They legitimise the idea that Muslims are an “enemy within” rather than just ordinary people. UKIP are in a mess. In their desperation to win votes UKIP are echoing the even nastier rhetoric we hear from the fascist Marine Le Pen. Donald Trump has targeted American Muslims with his attempted “Muslim ban”. We are not going to allow that kind of thing to happen here, whatever Nuttall and UKIP think. It’s obviously not just UKIP that have targeted the Muslim community. The Tories Prevent agenda has been all about criminalising Muslims and intimidating our community into silence. It was the ex-Tory leader David Cameron who had the cheek to describe Muslim women as “traditionally submissive”, well we’re not! I think it’s time we got organised against the racism aimed at Muslims, against migrants and against refugees. Whether you are a Muslim, a Jew, a Christian, a trade unionist or a student we all need to stand together against division. I’ve been working with Stand Up To Racism on their “Keep racism out of the election” campaign, more here. I was one of the speakers at the 30,000 strong Stand Up To Racism demo in March, on UN anti-racism day, supported by the TUC. And I’m speaking at this Tuesday night’s (2 May) Unite Against Fascism meeting on Le Pen, Trump and the rise of racism – 7pm, at Conway Hall Event page here. I’m not going to keep quiet while racists organise. This entry was posted on 28/04/2017 at 19:37	and is filed under Arron Banks, BREXIT, Douglas CARSWELL, EUkip; UKIP; Peter Oborne; Daily Mail; EUkip + The BNP; Libertas + The Jury Team;, Hillsborough, OLAF, Paul Nuttall, UKIP, UKIP Corruption, UKIP Fraud, UKIP LEADERSHIP. Tagged: Gerard BATTEN, GL-W, Greg Lance - Watkins, Greg_L-W, Hope not Hate, Malcolm Pearson, Tony Bennet, UKIP, UKIP Racism. You can follow any responses to this entry through the RSS 2.0 feed. You can leave a response, or trackback from your own site.